Searching for Treasure Tot Lot camp began with Morning Sing, where everyone got a chance to stretch and wake up before breakfast. 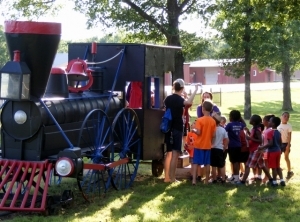 After time to play on the playground, campers heard a Bible Story, sang songs to learn memory verses, and participated in craft time. 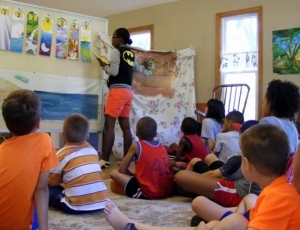 In the Bible Story time, the campers learned about the pages in the wordless book. They talked about how each color represented something different. For example, the black page represented how the bad things in us make our hearts dark and the red page is beginning with the birth of Jesus and the angels who celebrated his birth. 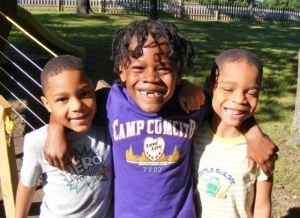 For some campers, this may have been the first time they heard the good news of the gospel. After the Tots woke up from their naps, they had a special tea party. The girls drank their juice out of glass punch cups, which they got to take home, and were also give n tiaras and capes. The boys received bubble swords and capes as the staff told them how special they are to God and are of great value to Him. Later on the entire Tot Lot camp went on a search for treasure, with clues leading them to the pony’s corral, then to the dining hall, the activity room and finally to the hidden treasure (ring pops!) at the train on the playground. The Tots went to sleep each night excited about what the next day would hold.